Berton B. Evertt B.A., C.A. Experience includes construction management, financial planning, all aspects of labour relations, and general financial management of Belvedere Seniors Living and associated health care facilities. Member of Management Team since 1991. Responsible for general operations of the facilities, capital expenditures, labour relations and negotiation of collective agreements. Provides leadership and direction to other managers. Management of Human Resources and Labour Relations functions including JOH&S and WorkSafe BC, Emergency Preparedness and Response. Responsible for Payroll and Benefits Administration. Knowledgeable regarding Collective Agreements and participates in negotiations. Provides Labour Relations as required at all facilities. Fosters good staff relations and is knowledgeable in coaching and conflict resolution. Completes accounting procedures, policies and protocols for all operations. Supervises accounts receivables and accounts payables. Establishes budget, monitors contracts and cash flow. Experiences include Social Work, Management in Complex Care and additional experience relative to caring for seniors.. Responsible for Quality Improvement at all facilities. Provides advice and in-services on Ethics for staff and Management. Compiles statistics and information for Quarterly Safety Reports. Dietitian in long term care facilities for over 15 years. Provides dietitian services to Belvedere Care Centre and Cherington Place. Accreditation Coordinator for the Organization since 2010. Significant participant in multi-disciplinary care conferences. Arranges and/or conducts in-services, presentations and annual mandatory education for all Staff. Chairperson for various safety committees and responsible for Emergency Preparedness and Response and JOH&S. Assesses residents’ functional abilities and provides recommendations, teaching and direction to care staff to assist residents in mobility. Provides annual education for MSIP. Responsible for marketing, tours and developing and maintaining relationships within the various community. Personal Physician for many residents. Participates in all care conferences. Participates in policy development to ensure good standards of resident care. Responsible for management of resident care and services. Supervises and monitors clinical practice at Belvedere Care Centre to achieve and maintain exceptional quality of care. 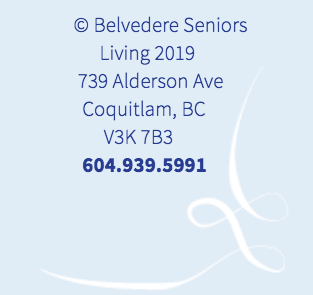 All management and staff teams across Belvedere Seniors Living’s facilities represent and reflect our philosophy and values, and are committed to Continuous Quality Improvement, putting research into action and incorporating evidence-based practice into our programs and services.